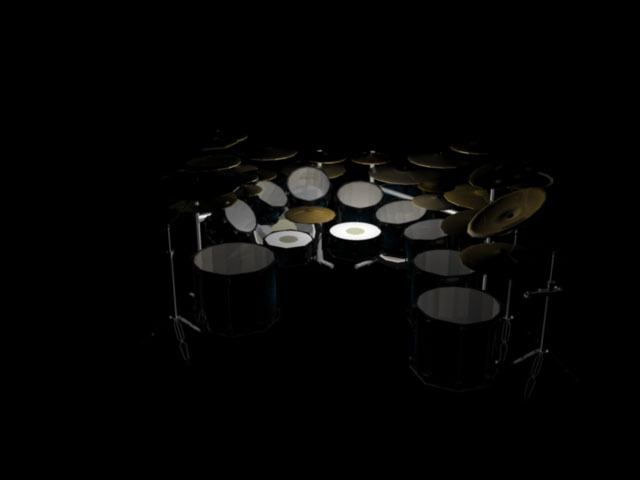 During the Summer of 2010, I felt that I really had to do something with drums. I had just gotten back into drumming after, well, many years of not playing but really liking the instrument. In the previous two semesters, I took the 3d modeling class and the lighting and texturing class. A light bulb went off and boom, I decided to combine the two. One of my professors, Todd Fechter, pointed me in the direction of another professor, Eric Farrar. He's a fellow drummer and also UTD's resident rigging master. I was just really getting into Dream Theater and Rush so there are heavy influences from Mike Portnoy and Neil Peart. The beginning stage of lighting. I think this was just the first light, a white ambient or point light. This is the final occlusion pass I made for my composite render shot. You can see the final product on my 3D Work page. Basically, this adds some extra depth to your image on top of your textures. AAX X-Plosion Fast Crash 18"
HHX X-Plosion Crashes 16", 17", 18", 19"
AA Sound Control Crash 16"
Vault Radia Nano Hats 9"
HHX Legacy O-Zone Ride 20"
Two years after completing the modeling and texturing of this beast, I finally add a turntable animation. I wanted to do this originally and submit this but I ran out of render time. The final touches were completed the night before the due date and I was already using an ATEC computer for overnight rendering. Anyway, enjoy. I'm really proud of this project. I already had a turntable camera set up, but like I said I ran out of time. I set Maya to render two hundred forty (240) frames, all at 1280 x 720 in the Targa (.tga) format. I took those images into Premiere, set them to one frame per frame at twenty-four frames per second (fps) and voila. I really enjoyed the control it gave me to edit the video but next time I'll try rendering directly to a video format to see how that works.